If you’ve ever wanted a recipe converted from cups to grams or ounces, I’ve done all the hard work for you! Check out this free printable infographic on how to convert imperial measurements into metric. Never wonder again! I get that you want your recipes in metric. I hear you. I know you are out there, with your kitchen scales. Tragically, sans cups and tablespoons. Today, I’m making all your dreams come true. It took me an entire weekend, but I banged it out. For you. Basically every baking ingredient in my pantry. Every ingredient I’ve ever included in any recipe on this entire site. And a handful of others too, just in case I ever choose to bake with them at any point in the future. I hope this wins me your undying love and affection. Please bookmark this page! I’m going to put it in my sidebar too, for easy access. And, I’ve even uploaded the jpeg file to the interwebz, so you can download it, print it out, and tape it to the inside of your cupboard door. Please pardon this interruption! We’ll return to your regularly scheduled sinful dessert recipe programming next week. Allie, I love this!!!! SO useful!!! Thank you so much Alice! Hope you’re having a great weekend my friend! Thank you !! that is great !! This is incredibly useful, thanks so much! I can’t tell you how much time I have wasted in the past, having to stop before making something to google for information like this and now it is at my fingertips. This is so incredibly useful! I love it! Thank you so much! I bake with my scale, and this is useful. Weighing ingredients is so much more precise, so I really appreciate that you like to do it that way Jane! I hope you enjoy the chart. Thanks so much for the sweet comment! You bet Nora! I hope it’s useful for you. Enjoy! Thanks so much. You have saved hours of work for me. I really appreciate that I can download and print. Much thanks!!! This. Is. BRILLIANT! I am the worst for conversions, so having all of this in one place is AWESOME! Pinned! Thank you so much Taylor and thanks for sharing on Pinterest too! Good work. Definitely a lot of time & effort must have gone in preparing this, thank you so much. Good work. A lot time & effort must have gone in preparing the chart, Congratulations & thank you so much. Thank you so much sweetie! I really appreciate the pin! I love this, it simplifies things so much, thank you! Of course! I’m so glad you can use it Cathy! Thanks so much for the great feedback! I would check the weights for the flour measurements again, for it has been my experience that 1 cup cake flour(100 gr.) 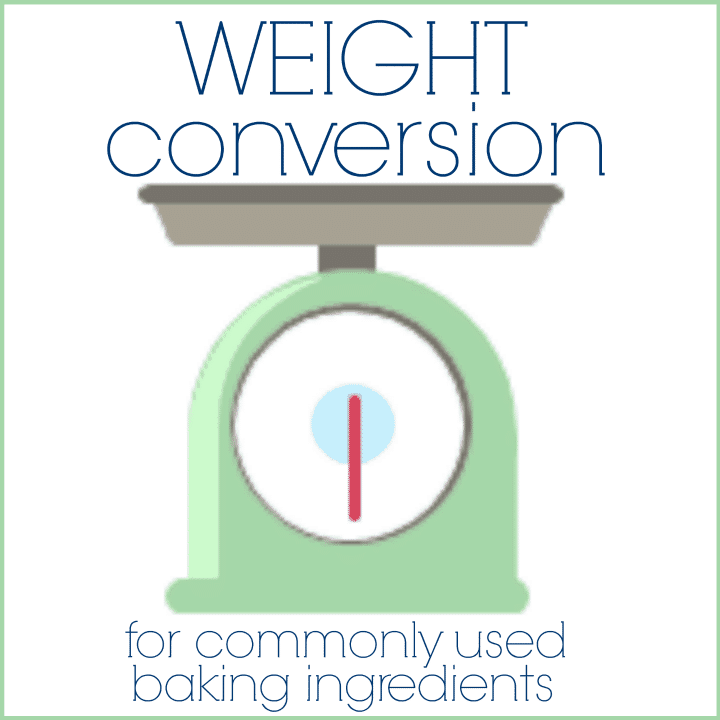 is lighter than 1 cup all-purpose flour (125g) which is again lighter than 1 cup whole-wheat flour (150gr.) Thank you. Thank you so much for taking the time to do this, I ALWAYS prefer to weigh vice measure cups. I’m off to laminate now, thanks! My pleasure Cherie! Hope you find it useful! Hi! 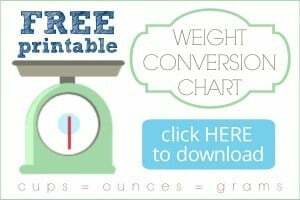 Thanks for the weight conversion guide, it’s a huge effort that’s very much appreciated by those of us who use metric measuremens! Please consider however, revising it so that the liquid ingredients are measured in mililitres as it is very unusual to measure liquids in grams! Thanks for the suggestion Gillian! I love all your post. Great blogger and baker. Generously sharing useful and tips and secrets in baking and science behind it. So lucky I found you. Thank you so much Trix! I really appreciate your sweet and encouraging comment! The only comment is, I still don’t understand when you are measuring a recipe that calls for 1cup of flour vs 1cup of water, we know that 1cup of water weights more than flour! How can I find the right weight??? Hey Vernon! 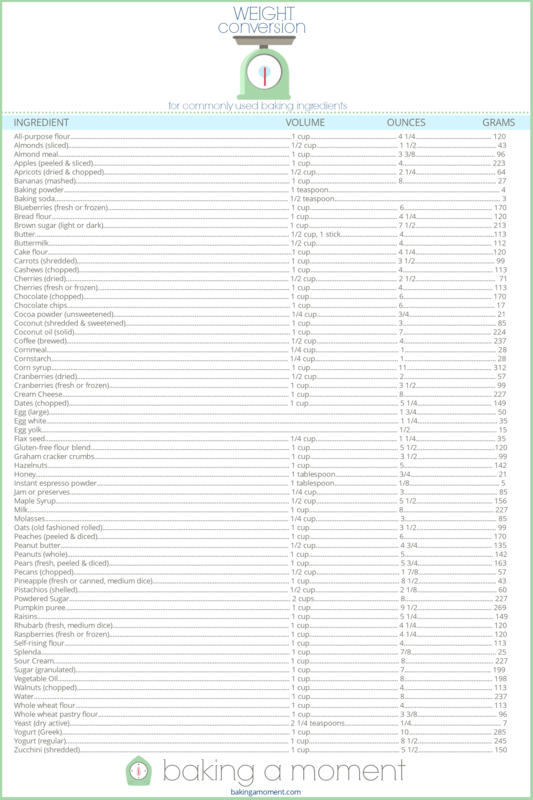 If you check out the chart, you’ll see that 1 cup of water is equal to 237 grams. One cup of all-purpose flour is equal to 120 grams. It’s all right there in black and white.